Registration is now open for the 2018-19 New Superintendents Leadership Academy! Your first few years as a superintendent require enormous growth as a leader. The New Superintendents Leadership Academy was created to support superintendents who are new to the position, as well as superintendents who want to continue to grow and build new strengths in this tough but rewarding job. 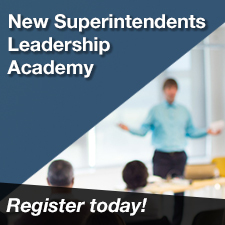 The New Superintendents Leadership Academy offers four in-depth sessions throughout the year to give you the skills and insight to excel as a superintendent. These sessions bring together experts who have one goal: Preparing you to succeed as a superintendent. The cost for the 4-session series is $500 for MASA members and $750 for non-members. For those who want to focus their development on a specific area, the cost is $175 per session for MASA members and $225 for non-members. All sessions will be held at the Michigan Education Leadership Group Building, 1001 Centennial Way in Lansing. For more information, contact MASA Deputy Executive Director Tina Kerr at tkerr@gomasa.org.